15° Shower or two increasing. 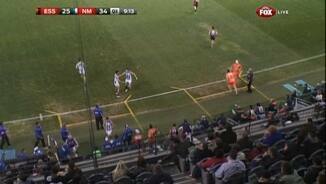 Kangaroos InterchangeNathan Grima off due to an injury. 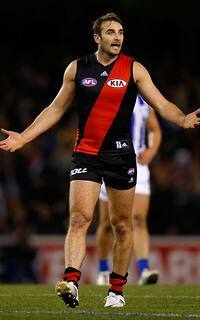 Bombers InterchangeDyson Heppell off due to an injury. Welcome to Etihad Stadium for the Essendon v North Melbourne Round 21 clash. 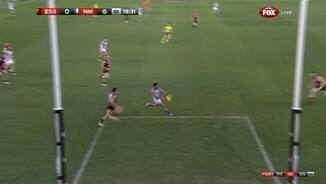 Rd 21, 2013: Match highlights All the best highlights from North's big win against the Bombers. 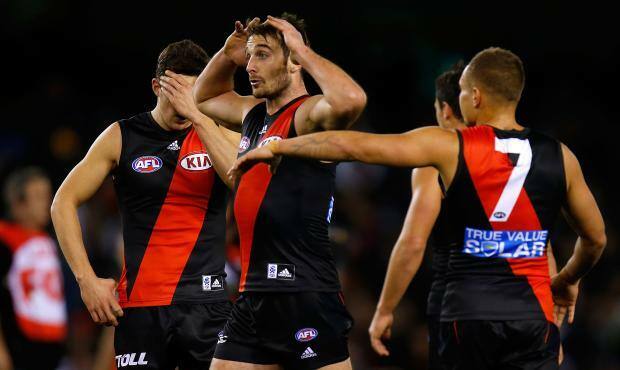 ESSENDON's season is officially in free fall after the club suffered its fourth loss in as many weeks. 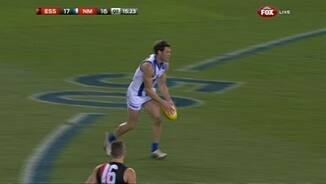 The Bombers were completely outplayed by North Melbourne at Etihad Stadium, going down 17.13 (115) to 9.16 (70). The loss was compounded by a foot injury to Dyson Heppell, who was subbed out of the game just two minutes into the second quarter. The midfielder sustained the injury late in the first quarter, and was seen going down into the rooms at the 26-minute mark. He was absent for the quarter-time address, and after attempting some run-throughs on the boundary, was ruled out for the match, with Leroy Jetta his replacement. Essendon fought hard in the last quarter to reduce the deficit, only to again be outscored by North Melbourne four goals to three. Even Nathan Grima got in on the action, kicking his first career goal in an effort that saw the entire side run to him in celebration. The Kangaroos did all the damage in the third quarter, when they piled on six goals to two to be up by 40 points at the last break. Drew Petrie (20 disposals, three goals) and Daniel Wells (17 disposals, four goals) were influential in that term, exposing the Essendon defence. Sam Wright (25 disposals, one goal), and Levi Greenwood (38 disposals) were dominant, as the Bombers lost their grip on the rampaging Roos. It was an effort that had threatened all day after the Kangaroos controlled the majority of the first half without putting any scoreboard pressure on. They jumped out of the blocks in the first quarter but managed just a six-point buffer at quarter-time. Essendon grabbed a two-point lead three minutes into the second term but the Kangaroos responded with three consecutive goals. "It was a great test of our depth because we've always known we've got that depth, but it's just a matter of how good that depth was. 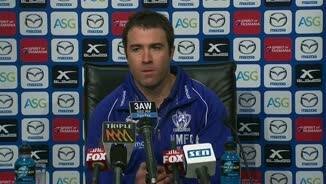 I thought we got the game on our terms for most of it," Kangaroos coach Brad Scott said on Saturday. "Our game is getting better with momentum swinging against us. I thought we iced that pretty well today." A Kangaroos interchange infringement handed the Bombers a drought-breaking goal through Tom Bellchambers, but the Roos once again found another gear, adding another two goals. It wasn't the only time the Kangaroos had issues on the bench, with a near-mistake making their substitution in the fourth quarter. Grima initially donned the subs vest, only to be told Leigh Adams would be the man to leave the game and make way for Will Sierakowski. The coach says Adams has a 'very minor lateral ligament irritation' in his knee, which he suffered just after the three-quarter time huddle. Jake Melksham (19 disposals, three goals) was the best of the Bombers, despite battling a foot injury in the second quarter. Jobe Watson finished with 31 possessions, while Michael Hibberd (26 possessions) was also damaging rebounding from defence. 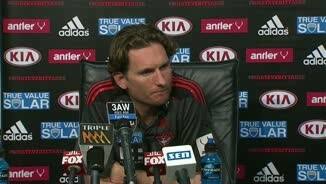 "I thought today that our work rate and our work ethic was much better than it has been," James Hird said. "I thought that our skill level with the ball in hand, around the contests and moving the ball from the backline and through the forward line was pretty poor. That's probably where we gave them too many goals from turnovers." "The pleasing thing for us was I thought our energy was there, I thought our work rate was there, but our skill level certainly hasn't come back to where it was three or four weeks ago." North Melbourne's side took a different look with the late withdrawals of Jack Ziebell and Scott Thompson, who were replaced in the selected side by Levi Greenwood and Sierakowski.